Synchronized swimming is a unique combination of dance, gymnastics and swimming. Synchro athletes perform acrobatic routines in the water, perfectly timed with music and their teammates - all while never touching the bottom of the pool! Amazing breath control, balanced strength, precise coordination, and mental toughness. Creative music selection and interpretation, suit design, and choreography. Synchronized movement, mutual success, trust, teamwork, and leadership development. Join us for fitness, fun, and friendships with over 70 athletes ranging from 6 to 19 years of age. Multiple levels of coaching and instruction. Practice groups organized by age, interests and skill. Novice, Intermediate, Advanced ("Age Group"), and Show teams. Masters adult team coming soon. 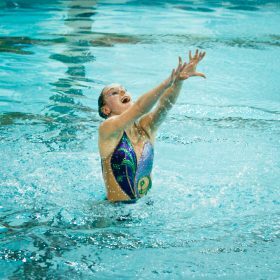 "Synchro Splash" - introductory 7 week program. ANA Synchro is the only YMCA synchronized swimming team in the country with 2 Olympic class athletes in its full time coaching staff. Plus 11 assistant coaches and a network of experts on nutrition, injury prevention, strength training, and mental preparedness. Head Coach Leah Pinette is a 9-time U.S. National Team member and was named to the US Olympic Selection Team in 2012. She also swam for The Ohio State University, the Santa Clara Aquamaids, and the New Canaan Aquianas. Assistant Head Coach Reem Abdalazem represented her home country of Egypt at the 2008 Beijing and 2012 London Olympics. Reem most recently swam and coached at Lindenwood University. We offer financial assistance to make sure that ANA Synchro is accessible to everyone. Our home pool is at the new Andover/North Andover YMCA, which also has new training equipment and new studios for dry land training. ANA Synchro is a non-profit club team. Being part of the Y offers many advantages to our athletes and families. Every coach goes through background checks and training before they can interact with athletes. We did our first International Club Exchange with Nautil Club Boucain from France in 2015. And we are already planning the next one. 2017 U.S. National Championships: Qualified 17 athletes. 4th place Junior Team, top 8 Senior Solo and Junior Combo, top 12 Junior Duet, Junior Solo, and 13-15 Team. 2016 U.S. Junior Olympics Championships: Qualified 23 athletes, 3 team routines, and 4 small routines. 2nd place 13-15 Solo, 4th place 18-19 Solo, 4th place 13-15 Duet, 9th place 13-15 Team, and 13th place 18-19 Team. 2016 East Zone Intermediate Championships: Qualified all our intermediate team routines, 25 intermediate athletes, and 9 12&Under Age Group athletes. Gold medals in the 13&Over Team, Trio, Duet and Solo events. ANA Synchro athletes have been selected for all the U.S. National Teams: 12&U, 13-15, Junior, and Senior. In 2016, one of our athletes competed at the Junior World Championships in Russia and two competed at the UANA Championships in Puerto Rico, In 2017, two athletes will compete at the Swiss Open with the Junior National Team. Head Coach Leah Pinette named 2015 East Zone Coach Of The Year. Coach Pinette was also named the 2014 USA Synchro Developmental Coach Of The Year, recognizing her ability to help athletes progress to higher levels in the sport. COME SEE OUR ANNUAL SHOW! Everyone welcome - future ANA Synchro athletes, fans, friends, family, and sponsors. Everyone performs - beginners, intermediates, elite athletes, and our show team.